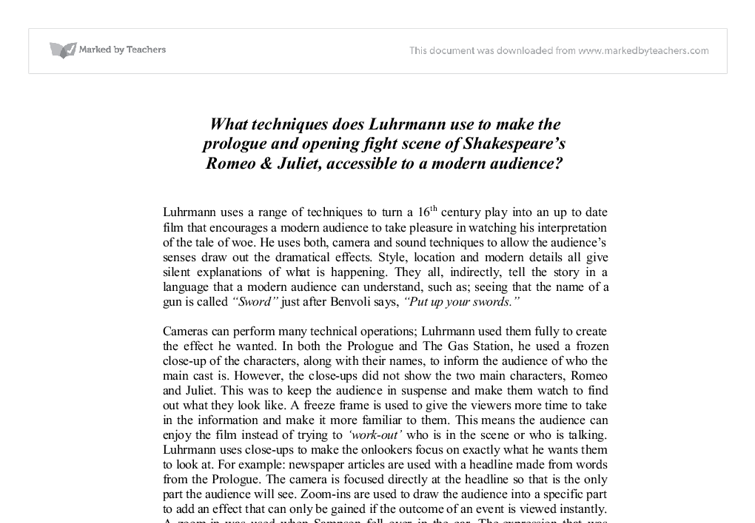 What techniques does Luhrmann use to make the prologue and opening fight scene of Shakespeare's Romeo &amp; Juliet, accessible to a modern audience? 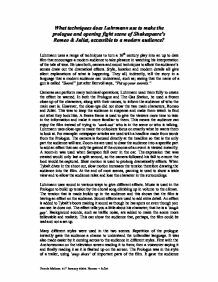 What techniques does Luhrmann use to make the prologue and opening fight scene of Shakespeare's Romeo & Juliet, accessible to a modern audience? Luhrmann uses a range of techniques to turn a 16th century play into an up to date film that encourages a modern audience to take pleasure in watching his interpretation of the tale of woe. He uses both, camera and sound techniques to allow the audience's senses draw out the dramatical effects. Style, location and modern details all give silent explanations of what is happening. They all, indirectly, tell the story in a language that a modern audience can understand, such as; seeing that the name of a gun is called "Sword" just after Benvoli says, "Put up your swords." Cameras can perform many technical operations; Luhrmann used them fully to create the effect he wanted. In both the Prologue and The Gas Station, he used a frozen close-up of the characters, along with their names, to inform the audience of who the main cast is. However, the close-ups did not show the two main characters, Romeo and Juliet. This was to keep the audience in suspense and make them watch to find out what they look like. ...read more. Background sounds, such as traffic noise, are added to make the scene more believable and realistic. This can show the audience that, perhaps, the film could be real and not a set-up. Many different styles were used in the two scenes. Repetition of the prologue instantly gave the audience a chance to understand the unfamiliar language. It was also made easier by it coming across to the audience in different styles. First with the Anchorwoman on the television screen reading it to them; then a voiceover saying it and finally reading it as it is flashed up on the screen. The Prologue was in the style of a trailer, using 'snap shots' of important parts of the film. It gave the audience 'tasters' of what was to come to keep the viewers in suspense and make them keep watching to answer "What happened to cause that?" Luhrmann needed to make the first scene as easy to understand as possible because if he did not the audience would become uninterested in the film from the very start. Most of the first scene was in the style of a Western with 'The Goodies' in my opinion the Montague boys, and 'The Badies', the Capulet boys. ...read more. Another similar example of this is when the camera tracks to a sign saying, "Add more fuel to your fire," and then they start to fight after the character has read it. This helps the audience see that all the trouble was started by an "Ancient Grudge" was brought up again by a simple spark and it raging like a fire between the two households. In addition to the religious influences that I explained earlier, there are another emphasis' on religion such as, Tybalt's gun decorated with The Virgin Mary and his waistcoat also decorated with The Virgin Mary. In conclusion, this shows how many techniques Luhrmann used to allow a modern audience understand his film. He needed to make sure they could comprehend the film's language so he used continuously used modern equivalents, to look at, on screen to show what is said. "It could have been written in Eskimo but the audience will still be able to understand what is being said." Baz Luhrmann, September 1997. His objectives were completed and his film was very successful and most people understood the story and didn't lose interest in it. In my opinion I found the film fully enjoyable and language added an effect that is not technical but simple that made it more interesting to watch (and listen to). Pennie Malone. 21st January 2004. Romeo + Juliet ...read more. Felicia makes a joke about Mitzi's son; there is a close up of Mitzi's face showing his aggression. Mitzi is very depressed and unsure about his life. The opening scene shows him singing a song about someone who has been to paradise but hasn't discovered themselves. For example, "And how did it long did he take to close up his arse? Was it at the full moon?" This form of humour also gives us information on the life style of the Greeks. For instance "Your dream stinks like a tanner's yard". This scene was created to get the point across to the audience, of who was the most powerful gang in the play. They all died, so none of them were. We had a soundtrack, which helped in creating a vicious atmosphere, for a fighting scene. He was a surrealistic practitioner who totally went against the traditional boundaries between actor and audience. He is also primarily responsible for the breaking down of the audience and actors barriers and the confrontational theatre of the post war period. However, another problem soon comes up. Paris wishes to take Juliet's hand in marriage. Her father, assuming that Juliet will be pleased, sets the wedding date (3 days later). After Juliet refuses to marry Paris because she is already married, her father becomes very upset. He hits her and promises to disown her if she does not marry Paris. The second presentational device is cinematography. This is used effectively in the scene where a television set with a news reporter within it. The background is very dark and the television is at first small positioned against the background. The opening shot is a long shot and has been taken straight on, with television in the middle. I was so chuffed but it all got ruined because of school. The morning was all right because not one of them was in any of my lessons until the last two periods this afternoon. That was just under two hours away. I had to get through lunch break yet. The r?s in the dialogue were exaggeratedly rolled in order to produce a comical effect. Another vocal skill that Stuart Goodwin used as the Prince was multi-rolling. This is accomplished by using different voices to represent different characters. In the Wild Bride, Stuart Goodwin multi-roled two characters, the Prince and the pears.